Suspension comes in many forms. In chemistry, it’s a term for a mixture of particles that would otherwise separate (such as a smoothie). In education, it can take the form of punishment for rule violations. It can even be a musical term for a prolonged note of a chord into the following chord. When it comes to your car, however, your suspension plays a crucial role in absorbing shock and cushioning movement from road conditions. The question is, how much do you know about your car’s suspension? Do you know what it is, what it does and — most importantly — how to know when it needs repair? Read on to become enlightened about all things related to the suspension of your vehicle. What Is a Car Suspension? Your car’s suspension isn’t just one part — it’s a system of parts. It involves springs, shocks, shock absorbers, tires, tire air and other components that combine to give the driver as much control as possible. 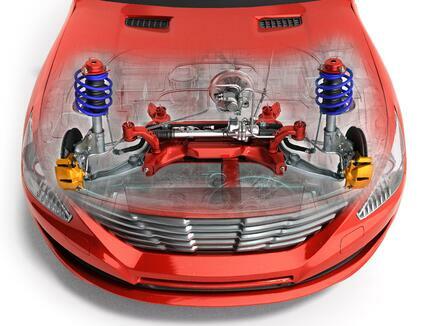 The suspension connects your wheels to the rest of the car and allows for smoother motion than there would be if the wheels were just connected directly to the body of the car. Suspensions have been around for a while — they were even on the original Ford Model T — so automobile manufacturers have known about their importance for some time. Since suspensions are all about handling, they can affect ride quality, which is why it’s important for car suspensions to have the right balance. If the suspension is worn down, damaged or improperly tuned, it can throw off the handling or ride quality. What Does a Car Suspension Do? Properly designed suspension will accomplish three things: provide excellent road isolation (absorbing or isolating shock from the road so it doesn’t affect passengers), maintain road holding (maintaining contact with the driving surface) and execute cornering (turning the car). Simply put, the suspension keeps the tires on the road and controls stability. Whether you’re on a short trek around Cleveland or long road trip, your car’s suspension will definitely be working a lot to get you from Point A to Point B. How Do You Know When Your Car Suspension Needs Repair? Like many of your car’s other components, a suspension is susceptible to damage or wear over time. The life of your suspension is often dependent on shocks and shock absorbers, which tend to last four or five years or so. But it depends on the type of car you drive, your driving style and the quality of the suspension system. If you notice any of the above situations, a certified auto technician should inspect your steering and suspension system and repair any issues. After all, your suspension and steering system is important. It controls how you turn the wheels of your vehicle, connects the vehicle to the tires and makes sure they maintain proper contact with the road. If you think you have a car suspension issue — or want to get it checked out anyway, or even want to have your suspension tuned — Rainbow Muffler & Brake has you covered. Visit any one of our six auto repair shops in Cleveland, Ohio today.